The Glengarry News, October 16th, 1958, pg. 1, col. 1 & 2. The St. Raphael's birthplace of Ontario's first premier, Hon. John Sandfield Macdonald, will be the site for a memorial plaque to be unveiled and dedicated next Friday afternoon, October 24th, at 2:30 o'clock. The new plaque is being erected one-quarter mile west of the church, on Lot 8-7th Charlottenburgh, on the property of Paul Emile Andre, but the original Sandfield holding. A grandnephew of John Sandfield, Ronald E. R. Macdonald of Alexandria, will unveil the plaque, which is being erected by the Ontario Archaeological and Historic Sites Board in conjunction with the Ontario Department of Travel and Publicity. Rev. J. McCaffrey, S.J., rector of the Canadian Martyr's Shrine at Midland, Ont., will represent the Board and will dedicate the plaque. Rev. D. A. Kerr, P.P., St. Raphaels, is in charge of local arrangements. Among the speakers, in addition to Father McCaffrey, will be Reeve Gerard Brunet, Fernand Guindon, M.P.P., and Hon. Fred M. Cass, Ontario Minister of Highways,who will officially represent the Ontario Government. In case of rain, the ceremony will be held in the auditorium of St. Raphael's School. St. Raphael is the birthplace of John Sandfield Macdonald, Prime Minister of the Province of Canada, 1862 - 64, and first Premier of Ontario, 1867-71. 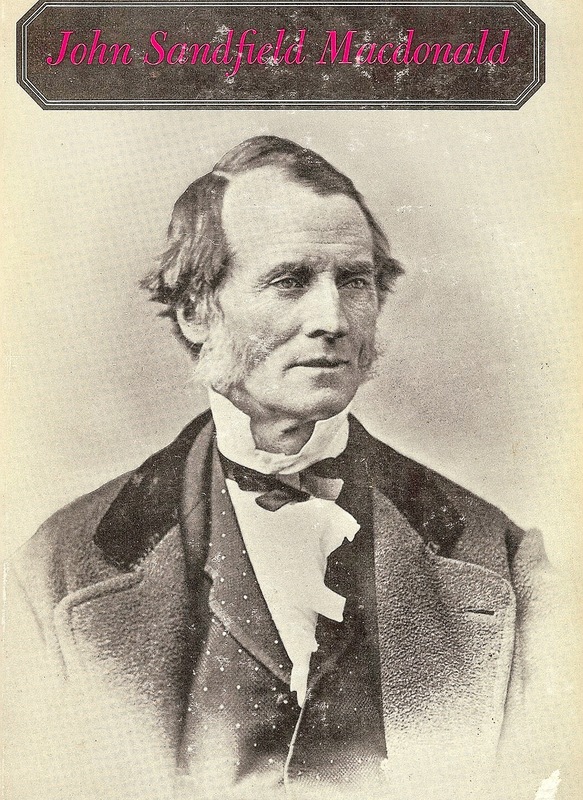 First elected to represent Glengarry in the legislature of Canada in 1821, he became one of the leaders of the Reform party and served in several ministries prior to Confederation in 1867. Always independent in his political thinking, he at first opposed the federation of the provinces. Later he co-operated with Sir John A. Macdonald, chief architect of Confederation, at whose request he formed a coalition ministry in Ontario. Erected by the Ontario Archaeological and Historic Sites Board.